Alcohol-related health issues among baby boomers are on the rise. 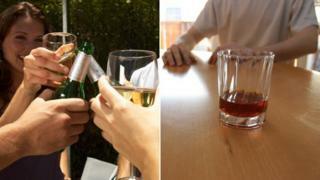 Daily drinking can start off as a social event but turn into dependency, addiction experts say. So when does social drinking become alcoholism? In the festive season, with office parties, Christmas, and new year, there is opportunity aplenty for yet another tipple. Since the 1950s, alcohol consumption in the UK has gradually increased. The NHS now spends more on alcohol-related illness among baby boomers than any other age group, with £825m spent on 55 to 74-year-olds in 2010-11 compared to £64m on under-24s. Estimates also suggest about nine per cent of men and three per cent of women in the UK show signs of alcohol dependence. But it is the functioning alcoholic that can slip under the radar - before their health issues are severe enough to need treatment. Dr John Marsden, an alcohol and drug dependency expert from King's College London, says a typical functioning alcoholic can manage to hold down a job despite having a "very severe drinking problem that they have been incubating over a very long period". "Alcohol problems are difficult to understand because they do not occur overnight. They are hidden from view which makes functioning alcoholics a group we cannot easily help." Rob C, who is 61, was one of them. At his worst he was drinking 1.5 litres of straight vodka per day. "Then I began to suffer blackouts, losing whole days and not remembering anything." He would be first to arrive at work, which made him able to set out his "drinks for the day with what looked like a bottle of mineral water". "I would hide bottles around the office. You think nobody else knows, that it doesn't smell, that you're getting away with it. But of course they did notice." For several years, maintaining a full-time finance job, he drank increasingly more during the day. What started as a social pastime nearly cost him his relationship. Now sober for eight years, looking back he says that even if a colleague had said something at the time, he would not have listened. "I resented the changes at work and told myself I deserved a drink. I would buy wine at lunchtime and drink it from a polystyrene cup." Wine turned to vodka for a "bigger kick" and lunchtime turned to morning through to night. Early retirement on medical grounds made his addiction worse. It was only when his partner threatened to kick him out that he sought help with Alcoholics Anonymous, who he says saved his life. Rob is not alone. In the last decade there has been a 63% increase in prescriptions for the treatment of alcohol dependency in England, as well as a 20% rise in deaths from liver disease. Prof Sir Ian Gilmore, a liver specialist and chair of the Alcohol Health Alliance, believes the number of people dying from liver disease will keep rising. The majority of people who have alcohol-related health problems are middle-aged, which Sir Ian says is a consequence of chronic alcohol misuse - many years of frequent heavy drinking, rather than binge drinking - a session of drinking large amounts of alcohol in a small space of time. But he says that though there is a big overlap, it is important to remember not all heavy social drinkers are dependent on alcohol. "Some people can control their drinking after work, others can't. If people are frequently drinking harmful levels of alcohol - over 50 units a week for men, 35 for women - most will end up suffering some form of physical, mental or social harm." A lifetime's worth of drinking is catching up with baby boomers, says Emily Robinson from the Alcohol Concern. The charity hopes that their campaign, Dry January, will help get people thinking about how much they drink, especially at home when units are harder to measure, and crucially, before they reach a stage where drinking is affecting their health. "The issue of people drinking every day is worrying as it's a way of slipping into dependency, as you need to drink a little more each time to feel the same effects," she says. Dr Marsden suggests the line between social drinking and dependency is clear. He says the first question that needs to be asked by clinicians or family members is: "Has anyone expressed concern to you about your drinking?" This question assesses whether a person's behaviour has negatively impacted on someone close to them, he adds. "If your alcohol consumption has caused a problem for someone else - I'm not rushing to label you an alcoholic but suggesting you need to take a closer look at your behaviour." There is a clear reason the baby boomer generation is now most at risk from alcohol-related problems, argues Dr Marsden. A hard-working generation led to an appetite for entertainment and relaxation. "There was work, there was money and increasingly the motivation to alter one's mood quickly. Alcohol has been the drug of choice to do that."